Black beans are sacred in Cuba and they are eaten with almost every single meal. 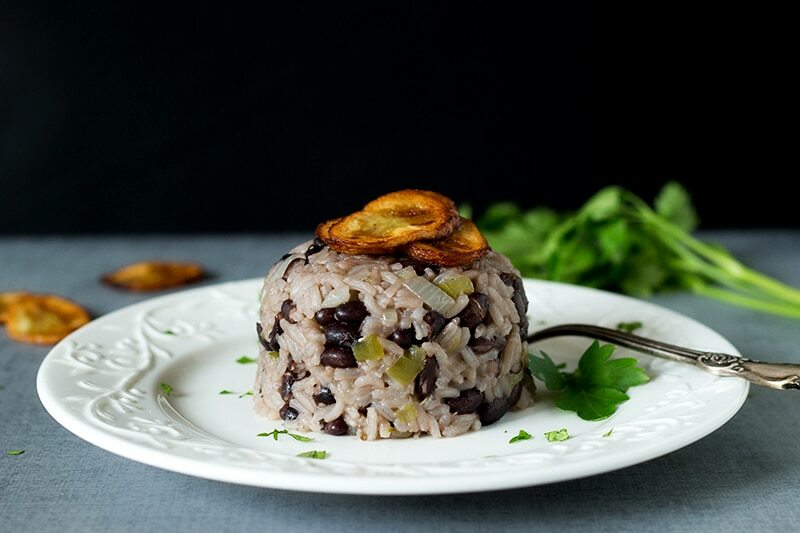 These Cuban black beans and rice, called Moros Y Cristianos, also feature bacon to make them even more delicious! A perfect side dish to anything! Black beans for Cubans are like rice for Asians or potatoes for the Irish. They are literally everywhere and it’s never enough of them. Frijoles negros (Spanish for “black beans”) accompany almost every dish. It’s a no-brainer for Cubans when it comes to picking a side dish. Roasted pork? Beans go well together. Grilled chicken? Take the beans. Do you like your Cuban sandwich with fries or without sides at all? Seriously? You’re nuts because it would be so much better with… You are right, beans. Seafood? Just take the beans and don’t ask why. Jokes aside. I can understand why Cubans are so in love with frijoles negros. If you cook ’em right… They are freaking delicious. The majority of black bean dishes can be split into two groups: beans with rice and without it. 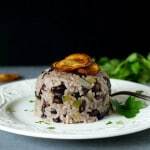 I’ve chosen to make the classic Cuban black beans and rice dish with a historic name “Moros Y Cristianos” which is “Moors and Christians” in English. By the name of this dish you can already guess that it has an interesting history behind it. 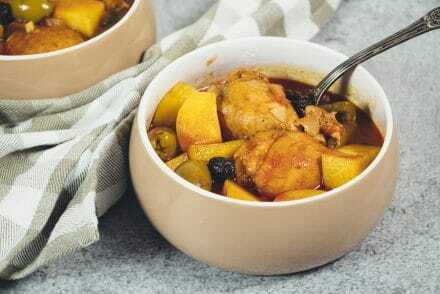 The name of the dish is a reference to the battles between the Islamic Moors and the Christian Spaniards that took place in Spain between 8th and 15th centuries. 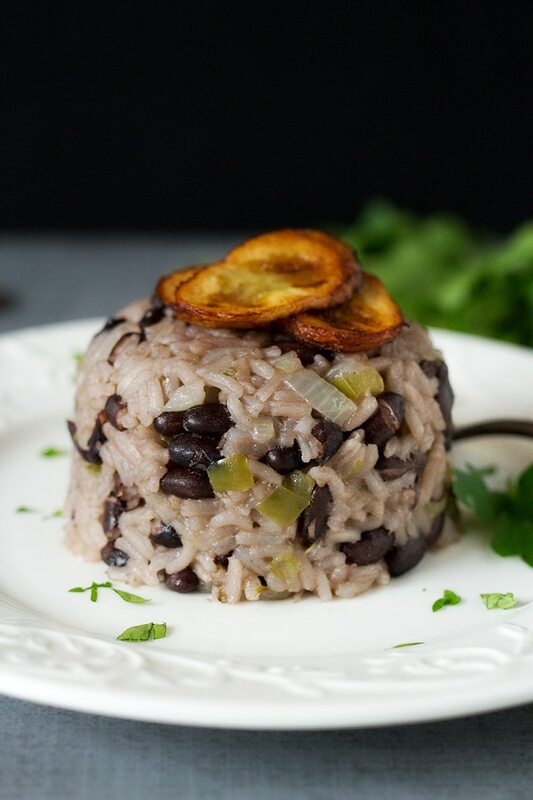 Black beans represent dark-skinned Moors, while the white rice represents light-skinned Christians. It was probably brought to Cuba by early Spanish settlers. We can thank them now because it’s one of the best bean and rice combinations I have ever tasted and I loved every bite of it! I must confess – there was a nagging thought in my head that this dish can end up bland. Quite the contrary! The flavors blend really well together. The pungent aroma of cumin and oregano is so on point here. Black beans are so tender they melt in your mouth. I also love how beans color the rice making it brownish. The idea to place the few fried plantain slices on top came suddenly – I saw them sitting on the counter and somewhere in the deep recesses of my mind, I remembered reading about the popularity of these fruits (are they considered fruits?) in Cuba. It was a successful decision in terms of look and taste. Moros Y Cristianos works best as a side dish. I made it to accompany Ropa Vieja and it was a hit. However, if you will add some bacon like I did, you can serve these Cuban black beans and rice on their own as a light main course. 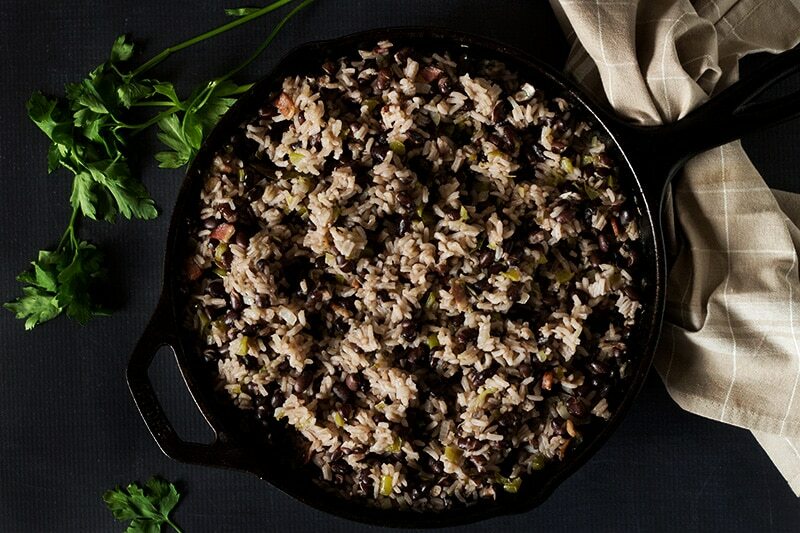 Flavorful and tender, these Cuban black beans and rice bring a taste of the Caribbean to your kitchen. Perfect as a side to anything! The beans. Soak the beans in cold water overnight. Drain and place in a pot with 2 1/2 quarts (litres) of fresh water. Add the onion, garlic, green bell pepper and bay leaf. Bring to a boil, reduce the heat and simmer covered for 45-60 minutes or until the beans are tender but firm. Check regularly and skim the foam off the surface. Drain the beans and reserve 4 cups of the liquid. We will need it later. The rice and beans. Heat the oil in a large pan, add the bacon and cook for about 3 minutes until brown. Add the onion, green bell pepper, cumin, oregano, bay leaf and saute until onion wilts, about 5 minutes. Add rice and stir thoroughly. Add the beans, reserved liquid, vinegar, salt and cook uncovered until liquid has almost evaporated. Stir with a fork, reduce the heat to low and cook covered for 20 minutes. Turn off the heat and let stand for 10 minutes more. Enjoy! 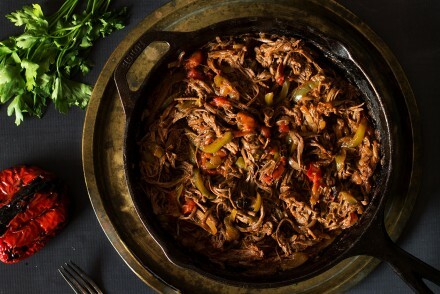 I made this to go along with your Ropa Vieja recipe. It was very good. My only problem with it is that it was a lot more work than some other cuban rice and black bean recipes I’ve tried, and it was essentially the same. I really didn’t notice that cooking the dried beans with the onion and green pepper and cloves changed the taste of the beans that much over just using canned black beans, which would make this recipe very quick and easy. Still, doing your two recipes together did make for a very good dinner. Thanks! Ed, it’s actually your choice whether to cook fresh beans at home or just use canned ones. I always lean towards the first option because canned beans are often too salty + too mushy. I also feel that taste difference when I cook them by myself with aromatics 🙂 If I would be in a hurry, though, canned beans sound like a perfect substitute!